Understanding of how light affects people and the willingness to invest in the right solution. Millions of people go to work everyday under office lighting that they don't like, and that impedes their productivity and wellbeing. But this can be so easily avoided with just a little understanding of how light affects people and the willingness to invest in the right solution. In a recent survey conducted across 17 countries by polling company Ipsos, a quarter of people said they were unhappy with the lighting in their offices. Another study by Zumtobel Lighting and the Fraunhofer Institute for Industrial Engineering found that four out of five workers had little or no control over their lighting – even though this was one of the most important factors affecting how satisfied people were with their working environment. The fact that so many employees dislike their lighting is worrying enough in itself, but a wealth of evidence shows that it also has a very real impact on people’s health and wellbeing – and therefore how well they perform at work. A number of studies have shown that people who like the lighting in their workplace are more satisfied with their jobs, less likely to take time off sick, and more productive. In fact, employers the world over are waking up to the huge impact that the office environment has on the health and productivity of their people, and lighting is a key part of that picture. So why does bad lighting persist? One reason is that employers don’t realise how bad it is – or that it matters. It’s only in recent years that scientists have really understood how light influences the body, however most of the guidelines for lighting offices were developed before such effects were known. As a result they have focused mainly on whether people could see well enough, and not on whether the light kept them comfortable and alert. 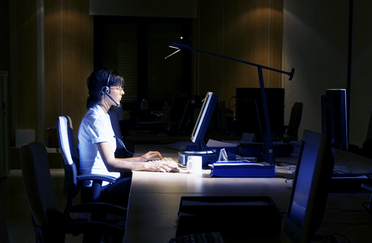 In some cases the guidelines may even have made problems worse – for years it has been recommended that offices be lit with high levels of horizontal illuminance (to light desks), and low levels of vertical illuminance, to avoid glare on computer screens. The unintended consequence was to limit the amount of light getting to people’s eyes, making it harder to stay alert. The result? Gloomy offices and drowsy workers. It’s an example of lighting that focused only on the task at hand, without considering people themselves and the office environment. To create a healthy, comfortable atmosphere, office lighting design should take into account three key considerations: task, space and face. lighting makes staff just a tiny bit more productive, take a little less time of sick, or make slightly fewer mistakes, then it’s a wise investment - and evidence about lighting’s effect on performance at work suggests it is possible for lighting users to make such improvements. All that’s needed is for businesses to assess their lighting not by how much light the fittings emit and how much electricity they use, but by the working environment they create.